Finally -- something good to watch on Sunday night. I know -- big joke, right? To most people, Sunday nights are so fertile with choices to watch on TV that it has become a challenge to take it all in. At least, that’s the position that has been taken in countless newspaper columns and blog posts in the last few years. There’s too much to watch on Sunday nights! declare these writers with faux exasperation. Meanwhile, they’re all time-shifting their viewing in order to watch everything -- or if they are among the “media elite,” they’re getting access to all these shows in advance anyway, thanks to the network publicity departments. So the truth is, getting to watch “everything” when schedules coincide or overlap -- on Sunday night or any other night -- is really not a problem today for critics or anyone else. I’ve never been one to complain about an embarrassment of riches. I tend to reserve my criticism for TV shows that are offensive, dull or apt to waste people’s time. Speaking of which, griping that there are too many good shows on TV is a waste of a critic’s time if there ever was one. Something that’s not a waste of time: Watching “Worricker: Salting the Battlefield” Sunday night at 9 (Eastern time) on PBS. Yes, PBS. This is one of these shows that seems to have come to American television almost completely unannounced. 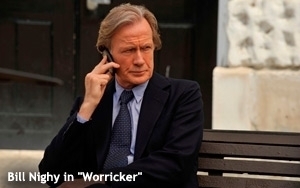 Or at the very least, I can’t remember seeing a single ad or any other piece of publicity about “Worricker,” which is a series of three made-for-TV movies starring the incomparable Bill Nighy as a British spy. And here’s some bad news: Due to the lack of buildup this show seems to have received, it’s very likely you missed last week’s “Worricker,” which was just about the finest production I’d seen on TV in weeks, and I’m saying that without having even seen the entire thing. All I know is, I was changing channels at around 9:45 and suddenly came upon a scene on PBS (Channel 13 here in New York) that included Nighy, Helena Bonham Carter, Dylan Baker, Rupert Graves, James Naughton and Christopher Walken -- starpower that was so arresting that I was practically forced to stay tuned in. And what a scene it was -- apparently the group was involved in making a deal in which one party was being forced under duress to pay another party $200 million. The duress was coming from Johnny Worricker, the spy played by Nighy, who played the role the way he plays so many of his roles -- inscrutably. Nighy is the acting world’s grandmaster at the art of self-containment. It’s as if he’s figured out that the most powerful way to play a scene is to remain as still and expressionless as possible. And for some reason, it works; you can’t take your eyes off him. His rival in this scene was Walken, playing the role of an eccentric, veteran CIA agent. Walken fans know that when they come across him by surprise in a TV show they’ve never heard of, it’s time to stop changing the channel. He was mesmerizing in this installment of “Worricker,” which was subtitled “Turks & Caicos,” the Caribbean nation where this TV movie was set. In Part Three, Worricker, who strategically “disappeared” at the conclusion of Part Two, is plotting his return to England, where the plot he has set in motion will be put to the test. It’s the kind of dramatization that the Brits specialize in -- stories of spies and spycraft. You don’t necessarily have to have seen Parts One or Two to enjoy Part Three of “Worricker,” which is well worth watching all on its own, even without the Walken character, whose storyline apparently ended with Part Two. If you have time between now and Sunday night, PBS has made “Turks & Caicos” available on its Web site here. “Worricker: Salting the Battlefield,” from “Masterpiece Contemporary,” airs Sunday night (Nov. 16) at 9/8c on PBS. 1 comment about " Spy Vs. Spy: PBS' Mesmerizing 'Worricker' Is Sunday's Best". Nicholas Schiavone from Nicholas P. Schiavone, LLC, November 14, 2014 at 6:31 p.m.
Good taste! Good Counsel! Good Night! Thank you, Mr. Buckman.